BLACK RECORD. Germans Past And Present. .. was the title of a million-bestseller in 1941. Deutsche Version dieses Artikels →hier. Its author, Sir Robert Vansittart, was as that time chief diplomatic advisor of his majesty, King George VI. The booklet “Black Record” was the collection of seven broadcasts in BBC, which had been released in November and December 1940. For some reason the full texts are still not available on word-wide-web, although due to British law broadcasts should be public domain after fifty years. It is the purpose of this very article, to make the full text open to teachers, pupils, historians and everyone having a stake in this topic. The echo of Black_Record was overwhelming and enthusiastic. Vansittart beckoned British courage and attitude to continue war with Germany, although military prospects were not optimistic at that time. France had been beaten; Germany had occupied Denmark and Norway, preempting a British campaign. Neither the United States nor the Soviet Union had entered the war. Britain was suffering severe losses due to German submarines. The United Kingdom stood alone at the battle-field against Germany and Mussolini’s Italy. In this time, the role of Vansittart cannot be overestimated. Honoring his achievements he was raised to the peerage as Baron Vansittart, of Denham in the County of Buckingham, in 1941, by appointment of prime-minister Winston Churchill to his majesty. Do you still believe that the Germans are a kindly people who are simply rebelling against the “ injustices” of a stern peace treaty? Do you think that Hitler is an isolated example of German brutality ? Sir Robert Vansittart, diplomatic adviser to the Cabinet, shows in a new booklet, “Black Record” (Hamish Hamilton, 6d. ), that the German never alters. This booklet, a series of broadcasts, is an invaluable record for the historian, the sentimentalist and the pacifist. It tells you the real reason why we are at war. 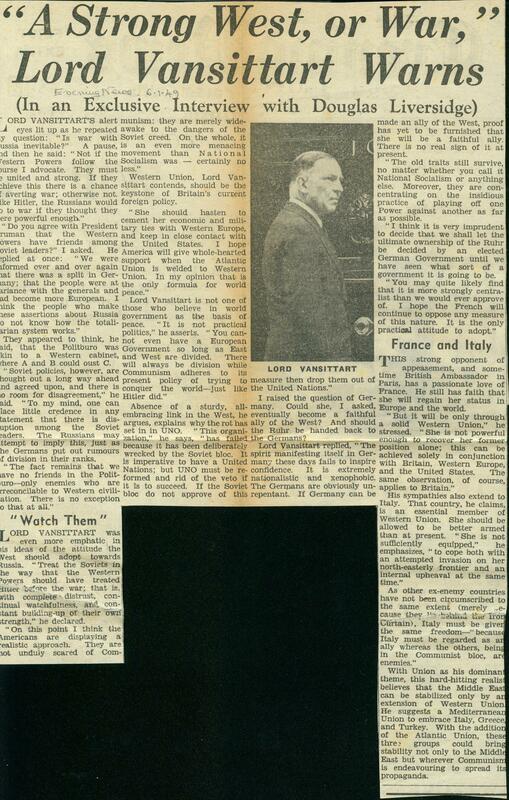 Even more enthusiastic and extended the article by Philip Jordan in News Chronicle on March, 11th 1941 with its headline: Diplomat is Best-Seller. BRITAIN has a new bestseller, out-topping most others. 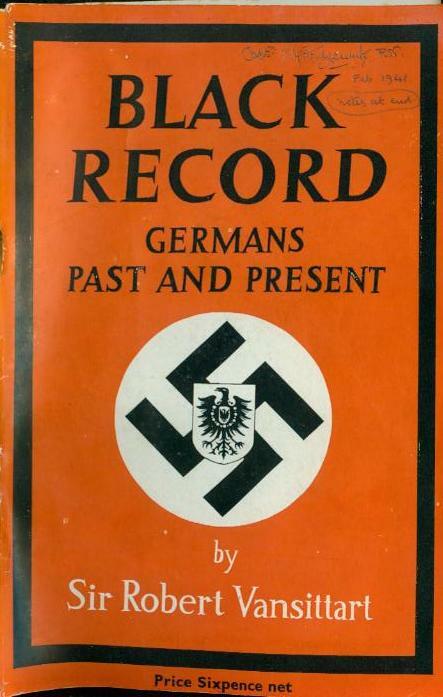 It is “Black Record,” reprint of Sir Robert Vansittart’s broadcast talks on Germany. More than 250,000 copies, the publishers told me yesterday, have now been sold. They say the demand shows no sign of dropping. This information set me thinking of the days when the “Times” was implicitly advocating the secession to Germany of the Sudetenland and publishing a letter jointly signed by, among others, Barry Domvile, Lord Londonderry and Pitt-Rivers, saying, “We see . . the promise of a new era compared to which the tragic years that have gone since the war will seem like a bad dream”—the days just- before and after Munich, in fact. I USED sometimes then to seek comfort in a large room at the end of the ground floor corridor of the Foreign Office. It contained no Munich-fancier. It was a large, dingily opulent room with, two windows on St. James’s Park, two on the Horse Guards. Besides furniture, it contained two globes, and on an: expensive easel a map of Europe, from which nearly all the colours had faded, so that, with the exception of these islands, it looked almost as though the greater part of the Continent was one huge state. I thought it an omen at the time. THE room belonged—it still does—to Sir Robert Vansittart, Chief Diplomatic Adviser to the Government. Let us admit that if his advice was not asked at the time of Munich, his own temperament may have had something to do with it. He does not suffer fools as gladly, perhaps, as a diplomat should. On the other hand the amateurs who then controlled our foreign policy didn’t suffer wise men gladly. The rest is history. If all that seems past, it has something to do with the violent attacks made on him, for “ Black Record,” if it is his view of the German nation, is, by implication, his justification and a round condemnation of the Municheers. WHAT is this pamphlet? It is an analysis of the German temperament, pointed with historical references ; and it concludes with suggestions as to how Germany’s perpetual desire to dominate the world can best be curbed in future. Its moral is that Goethe was right when he said that as an individual the German is a human being, but that as a race they are impossible. It is written in exuberant language, extravagant, if you like. I grant that. It is only fair to say, however, that some of the attacks made on Vansittart’s thesis have been neither prejudiced nor violent. 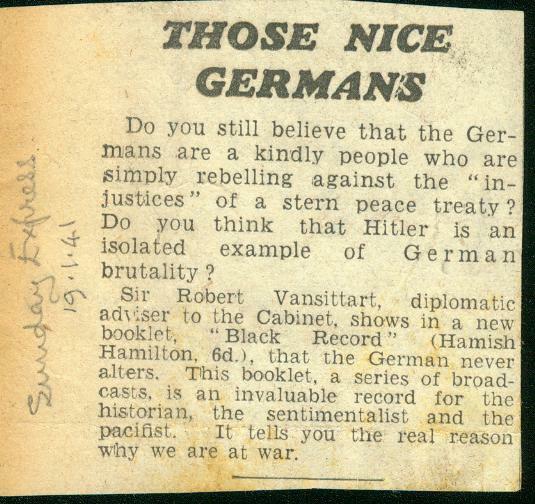 Many who have given much thought to the German problem disagree honestly with Vansittart; and have said so. 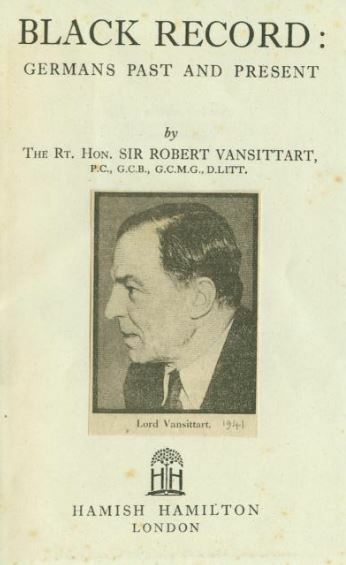 But nearly all the attacks— both from Right and Left—have been by implication D. N. Pritt asks the Minister of Information what use Dr. Goebbels has made of Vansittart’s material. The answer, of course, is “None.” The “Times,” finding nothing better to attack him about, attacks him for having spoken in public at all, which is irrelevant. Let us leave it at that. But what sort of man is this who can perform the astonishing feat of making bedfellows out of Pritt and Dawson who edits the “Times ” ? IF I were asked to whom I would most surely apply the word “civilised ” the face of Vansittart would come into my head and stay there. I could hardly describe him: he is too lively, even at 59, to be pinned down. You feel that he shouldn’t be indoors, that a tennis racket might appear suddenly in his hand, and that he wouldn’t serve a fault. Or that he’s only waiting for the right moment to sit down and dash on paper some thought that has suddenly taken shape behind two sharp, pale eyes. In the years I’ve known him I have hardly ever seen him sit down, except at a meal. Walking about his room with a Turkish cigarette between his fingers, he will suddenly put his hands up to his elegant head, as though he had just remembered some desperately unhappy piece of news. But that isn’t it, at all, for when he takes them down again a second later he will be smiling. It’s just a habit. He’s tall, broad-shouldered, and if he has the kind of face that has never known what hardship is, that doesn’t mean that it hasn’t known something of great disappointments. I DON’T know, but I guess that he would wish to be more remembered as a poet than as a diplomat. But he won’t be, of course. If I envied any man I should envy the one who will come to write his biography in 60 or 70 years’ time. He will be writing the history of Britain’s most tremendous period; and looking at the photographs that will be available to him; he will wonder why, perhaps, this man had a face that was not bitter. “The spirit manifesting itself in Germany these days fails to inspire confidence. It is extremely nationalistic and xenophobic. The Germans are obviously unrepentant”.